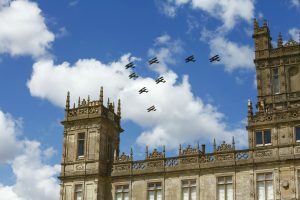 On Saturday 8th and Sunday 9th September, Highclere Castle, (filming location of Downton Abbey) will host a special centenary event to mark 100 years since the end of the First World War. The Earl and Countess of Carnarvon will open the castle and grounds to the public, thanking those who serve and save in today’s world. Vintage cars, planes, exhibitions, music, cream teas and football matches will entertain those on the ground, whilst scheduled air displays (including the Red Arrows) will light up the sky. The UK Sepsis Trust will enjoy a huge presence at the event, of significant interest to the national press. We will convert the lawn in front of the castle into a football pitch with seating to host celebrity football matches and guest speakers. We will also be hosting an interactive exhibition of a rare RAF Chinook helicopter as well as raffles and games. Join us for a weekend of activities and events, commemorating the centenary of the end of the first World War and raising awareness of the illness that claimed so many lives in the Great War and still affects 250,000 people in the UK every year.